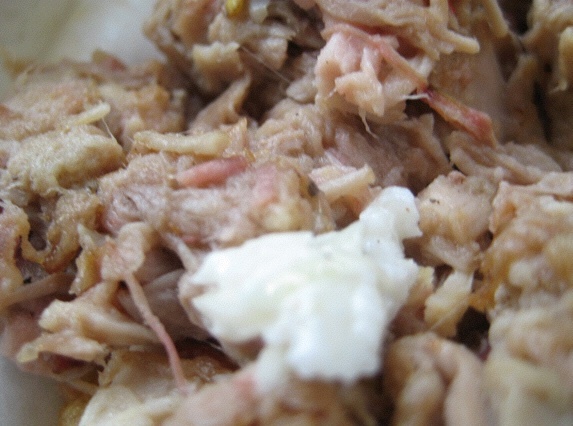 This Little Piggie: Vinegar-based pulled pork with a dollop of cole slaw, from Louise’s Famous Restaurant in Linville Falls: First-hand evidence that the terrorists have lost.Asheville, North Carolina—Ever since we accidentally met Robyn, the “Need a Prayer? Stop Here!” sign-holder from Athol, Massachusetts, my friend and I have come to think of every fluke occurence on our trip as the work of, if not God (who presumably has better things to do), some sort of lesser deity like Walt Whitman. For instance, if we knew anything about cars, we might not have driven 2,000 miles with a leaking radiator cap, which meant we never would have broken down outside of Wytheville, Virginia, and been forced to spend the night at a campground/spiritual retreat with members of the Last Days Gospel Church band. They hold services every Saturday, but on Wednesday they were just there for a birthday party, when a jam session broke out. Last Days is a a “Cowboy Church,”which means its evangelical and very informal—”come as you are in the eyes of Jesus Christ our Lord and Savior,” as Patti, the group’s guitarist, explains to me. She’s practicing what she preaches, wearing green crocs and a Tweetie Bird t-shirt. Patti invites me to stop by on Saturday, and to be honest I’d love to, except it’d mean another four days in Wytheville. We made it to Asheville, though. Finally. And on our way we discovered that the Highland Games, a sort of Scots-Irish Olympics, are being held this weekend outside Linville. One of our few rules on this trip is that any time we have an opportunity to watch competitive sheep herding, we can’t pass it up, so expect a full report tomorrow. From there, it’s up into the Smoky Mountains, through the Cumberland Gap, and into the Republic of RandPaulia.